Please share this page to help lil’ ol’ Lil-Lils! 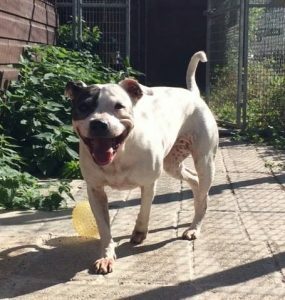 Delightful little Lillie is a Staffy cross lady of 10 years who has been waiting to be noticed at Oxfordshire Animal Sanctuary for 5 years now! 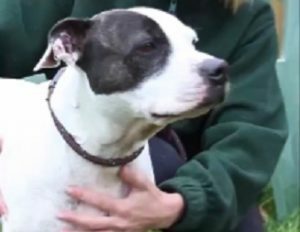 She’s an active, bouncy girl and could live with sturdy, dog savvy children aged 10 or over. She needs to be an only pet, since other dogs are worrisome and cats are fun to chase. She really, really loves people! When staff or volunteers come to take her for a walk, her whole being lights up with joy! Lillie is always thrilled to receive any attention. 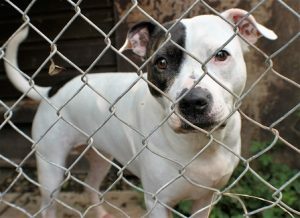 She does like a good fuss… and if you happen to have her lead and say the “W” word, she’ll be your best friend forever! 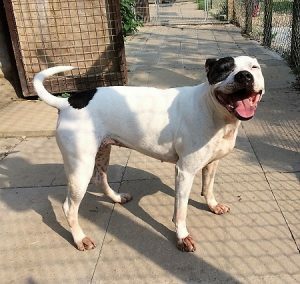 Lillie needs to be kept on the lead when any other dogs are around as she is not a fan. That’s the only precaution necessary though and if you take to a quiet place, she’s nothing but fun! She can be strong on the lead, especially at first with her excitement at being out. Who wouldn’t be excited, after being cooped up? 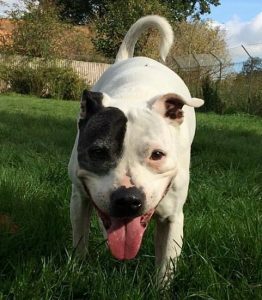 At the rescue, she knows exactly where the secure field is and takes walkers straight there so she can gallivant off lead to her heart’s content! 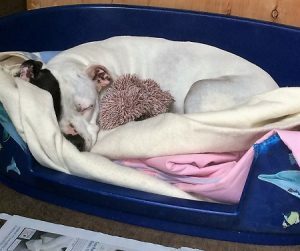 For the uninitiated who don’t yet know why Staffies are so wonderful, the UK Kennel Club describes them as “highly intelligent and affectionate”. They are the only dog whose breed standard calls them “totally reliable”! You will certainly be able to rely on Lillie’s love and gratitude if you give her a chance. Oh, and they usually snore when sleeping, which is a bit cute! Lillie has skin sensitivities, particularly in Summer, which are controlled with a low cost antihistamine tablet once a day. 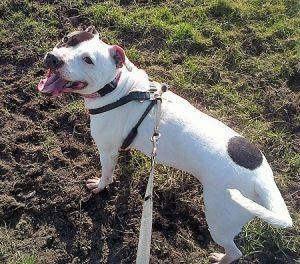 Otherwise though, she’s a robust girl – happy bounding around outdoors and being fussed by everyone she meets! OAS have of course done everything they can over the years to keep Lillie content. 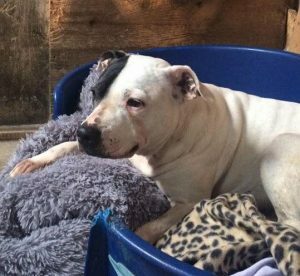 She has 2 hours of exercise a day, staff and volunteers who she adores and a comfy bed in her kennel. She is house trained, knows basic commands and is a sweet and loving Good Girl! It’s time she went home now. Or, you can drop in to fill out a form and meet her from 2-3pm every day except Tuesday and Friday. Please say you saw Lillie featured on the Oldies Club website. This replaces Lillie’s original page dated 13 August 2016.